The Fullerton Hotel Singapore is a five-star luxury hotel located near the mouth of the Singapore River, in the Downtown Core of Central Area, Singapore. It was originally known as The Fullerton Building, and also as the General Post Office Building. The address is 1 Fullerton Square. The Fullerton Building was named after Robert Fullerton, the first Governor of the Straits Settlements (1826–1829). Commissioned in 1919 as part of the British colony’s centennial celebrations, the building was designed as an office building by Major P.H. Keys of Keys & Dowdeswell, a Shanghai firm of architects, which won the project through an architectural design competition. The architectural firm also designed the Capitol Theatre and the Singapore General Hospital. The northern end of the building covers the site of Fort Fullerton, a fort built in 1829 to defend the settlement against any naval attacks. In 1843, the fort was extended after a sandstone monolith, the Singapore Stone, with an inscription possibly dating back to the 13th century was demolished. A fragment of this monolith was salvaged and preserved in the collection of the National Museum at Stamford Road. The fort gave way to the first General Post Office and the Exchange Building in 1874. Plans to erect Fullerton Building were drawn up in 1920. However, due to a lack of funds, construction only began in February 1924. Built at a cost of $4.1 million and after delays of a few months, the building was completed in June 1928. The Fullerton Building was opened on 27 June 1928 by the Governor, Sir Hugh Clifford, who suggested the building be named after Robert Fullerton. The building had five founding tenants: the General Post Office, The Exchange, Singapore Club (now Singapore Town Club), the Marine Department, and the Import and Export Department (later the Ministry of Trade and Industry). It also housed the Chamber of Commerce, and various government departments dealing with agriculture, fisheries and forestry. The General Post Office (GPO) was the anchor tenant, which only moved in a fortnight after the Fullerton Building’s official opening. GPO covered the two lower floors with postal halls, offices and sorting rooms. There were mail drops through which mail would fall to a band conveyor on the basement and dispatched up to the sorting room. The basement was connected to a 35-metre subway that ran underneath Fullerton Road to a pier, where overseas mail would be transferred to or picked up from ships. In the last days before Britain’s surrender to Japan in 1942, the building was used as a hospital, with makeshift operation rooms for wounded British soldiers. During the Japanese Occupation of Singapore, Governor Sir Shenton Thomas and Lady Thomas sought refuge in the sleeping quarters of the Singapore Club. The Fullerton Building was also where General Percival discussed with Sir Shenton the possibility of surrendering Singapore to the Japanese. Subsequently, Fullerton Building became the headquarters of the Japanese military administration in Singapore. From the 1970s to 1995, the Inland Revenue Authority of Singapore used the building as its headquarters. The General Post Office, under Singapore Post, vacated the building in March 1996. Internal alterations were carried out on the building by the Public Works Department in 1985. Though plans were initiated to conserve the Fullerton Building after that, it was only gazetted as a conservation building by the Singapore Government in 1997. In 1997, Sino Land (Hong Kong) Company Ltd, a sister company of Far East Organization, acquired the Fullerton Building from the Urban Redevelopment Authority (URA). It spent close to another S$300 million converting Fullerton Building into a hotel and building the two-storey commercial complex One Fullerton opposite Fullerton Road. Renovation works on the Fullerton Building were completed on 8 December 2000. The Fullerton Hotel Singapore was officially opened by then Prime Minister Goh Chok Tong on 1 January 2001. The site, sandwiched between the Civic District and the central business district, was sold together with an underpass and the seafront site on which One Fullerton now stands for S$110 million. The two are linked by an air-conditioned underground pedestrian walkway with travellators. 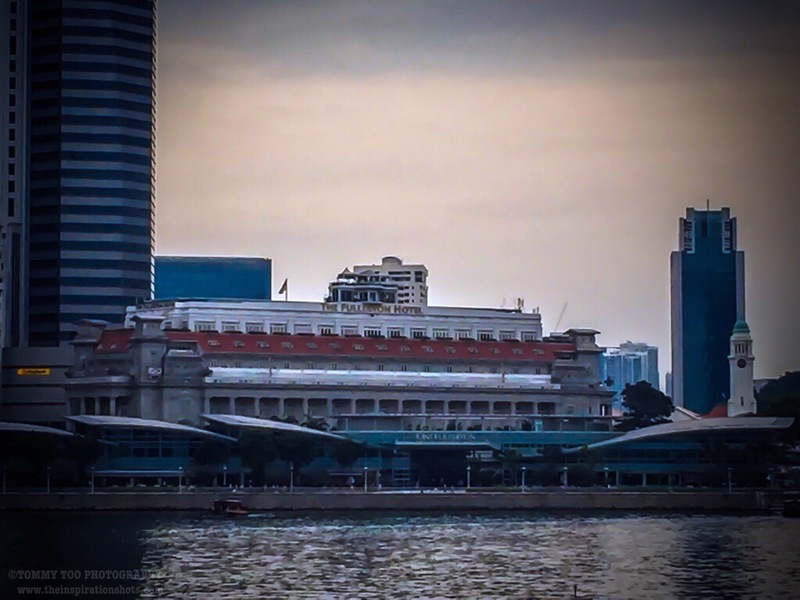 To ensure that the historical Fullerton Building continues to be visible from Marina Bay, URA specified a low building height for One Fullerton across the road. This also ensured that guests at The Fullerton Hotel would have unobstructed views of the sea.